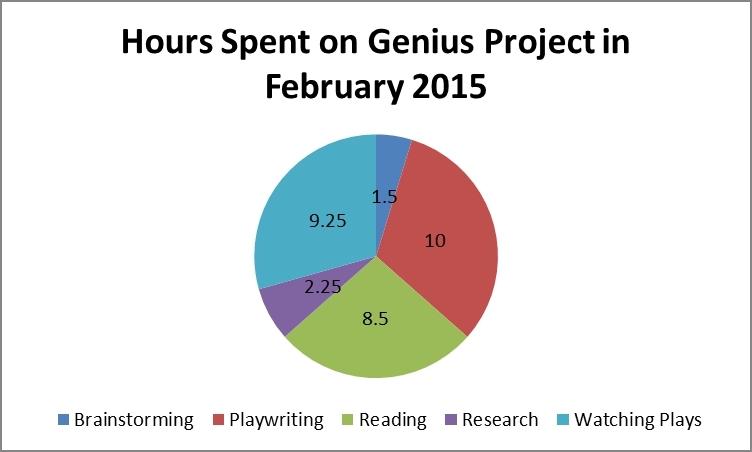 I started off last month’s update saying that I was disappointed in my efforts for the Genius Project in January. I realized afterward that I was being a bit hard on myself. My goal was to spend a minimum of 30 hours a month on the Genius Project and any time I reach that target, I should be happy. My disappointment was because I knew that I had started late in the month and hadn’t done as well as I could. I also have high hopes that my 30 hours a month will increase substantially — or else it’s going to take me 27 years to complete this project! But that is getting ahead of myself — trying to walk before I can crawl. The important thing is to establish the routine and develop the habit of working regularly. 30 hours a month is the goal for 2015 — if I go over, great — but I should only be disappointed when I do less than 30 hours. I feel much better about the amount of time that I spent on the GP in February, even though it was less time. And to be truthful, I didn’t get a lot done in the first week and a half in February. Towards the end of the month, though, I had established a routine and I was following it consistently. The great thing is that I spent more time writing than any other activity. Yay! I also decided to work on a project that I wanted to work on, instead of trying to force myself to work on something that I thought I “should” work on. So, I spent most of my writing time working on adapting my play Cast Party into a musical. Another great thing was having brief discussions or emails from fellow writers that helped inspire me when I was wavering. Procrastination affects everyone! It also drove home the importance for finding inspiration either from other people or other shows, etc. So that 31.5 hours moves my running total to 653.5 hours done. Only 9,346.5 hours to go!